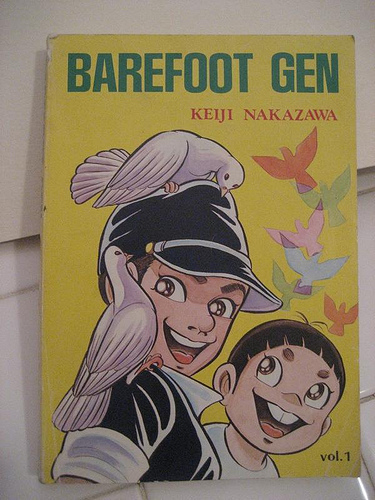 Thanks for all the great contributions to the Barefoot Gen MMF! I had a fantastic time hosting it and hope to do it again in the future. As of now, I have become extremely busy with some work related stuff but wanted to keep this blog updated so I am going to post links to all the podcasts that I’ve done, just so you can check out more about me, if you are interested in learning about the personality behind this blog. Episode #31 of the Manga Out Loud podcast, talking about the Barefoot Gen MMF with Ed Sizemore, Rob McMonigal and Patrick Jones. 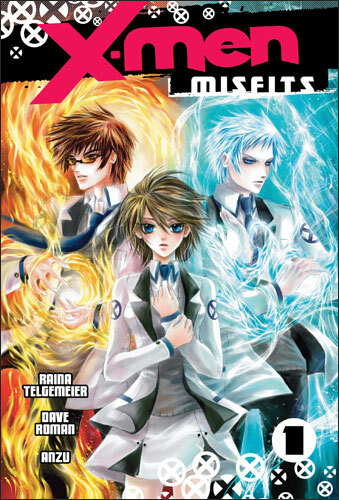 Episode #25 of the Manga Out Loud podcast, talking about Twin Spica with Ed Sizemore, Johanna Draper Carlson, Daniella Orihuela Gruber and Tim Maughan. Episode #20 of the Manga Out Loud podcast, talking about Batman: the Brave & the Bold with Ed Sizemore. Jammer’s Animovie Podcast #16 with Daniella Orihuela Gruber and Doctor talking about the Manga Publisher’s Coalition. Jammer’s Animovie Podcast #9 with Daniella Orihuela Gruber, Mikey D. Pirate and Pwngoatjunkie talking about the whole new world of manga! Patrick Jones is a guy, that happens to be on the internet, you can find him on twitter by the username @Johnny_Jobbs. WARNING: the following content bellow does not contain BRUTAL IMAGES AND CONTENT. Viewer discretion is not needed. 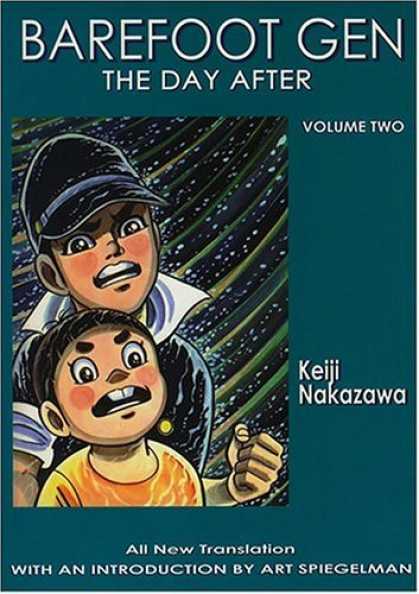 Now to start at the painfully obvious comparison, Barefoot Gen & Grave of the Fireflies are both Japanese stories made by Japanese people that take place in Japan around World War 2. 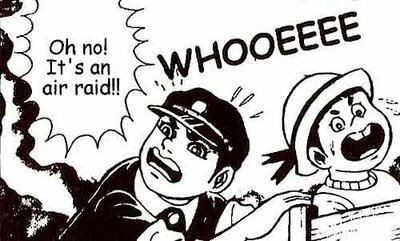 Barefoot Gen & Grave of the Fireflies are both based on real stories. Akiyuki Nosaka and Keiji Nakazawa both experienced to an extent the bad things in the two stories. Please note that I said to an extent. The two stories have changes to what actually happened in real life, similar to what Tim O’Brien did with his experience in Vietnam in the semi-autobiography turned Fiction, The Things They Carried , they changed around stuff to make the story better and to portray what Tim O’Brien names in The Things They Carried the “Story Truth” which according to Tim, is what “truly” happens or what the person who wrote the story felt what happened, While The Things They Carried came after the two stories were written. I (teh writer, Patrick Jones) believe that Akiyuki Nosaka and Keiji Nakazawa had a prototype of that idea while they wrote down their stories While Akiyuki didn’t actually die (that’s how he was even able to write the story in the first place….whoops SPOILERZ) Akiyuki wrote the story as an apology to his sister because he feels guilty about her death. To Akiyuki, he felt like he died when her sister died (At least that’s what I think…you might want to take that with a grain of salt). 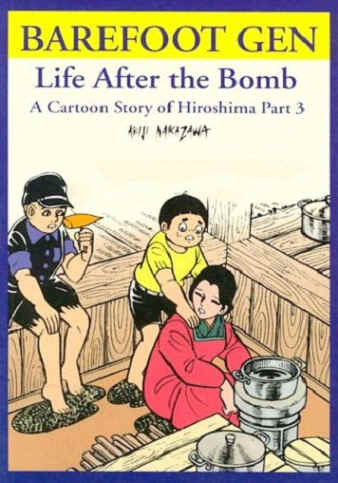 And Keiji did not actually help give birth to his mother’s child during the aftermath of the atomic bomb , but in Hiroshima: The Autobiography of Barefoot Gen Keiji says that he was told about his mother’s birth in such exquisite detail that he felt like he was there helping give birth to his sister. This in my mind and hopefully your mind shows that the two authors had some prototype of the “Story Truth”…or not, but that would destroy my argument. There are numerous other comparisons that can be made between the two; I can hit some out right now. They are both had live-action movies, they both were written by male, Japanese authors and they both were targeted to all audiences. But another important comparison that MUST BE MADE is symbolism. The two stories are heavily reliant on symbolism whether its B-29 bombers to Gen’s barefoot feet or to the bomb (or bombs in Grave of the Fireflies case) that was dropped on the main characters town, the two have symbols, but so does almost every story ever. What is truly notable about these two is that they use one BIG symbol that they use to HAMMER THE MESSAGE OF THE STORY INTO YOUR BRAIN. In Barefoot Gen, the main symbol is Wheat, that delicious delectable food that completes our sandwiches and makes most cereal possible, is used to tell Gen and the audience to be strong and to stick to what you believe in. 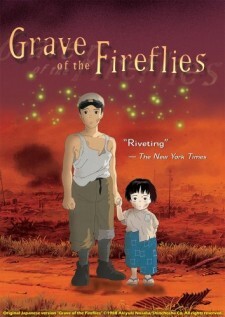 In Grave of the Fireflies the main symbol is, of course, Fireflies, that blinking insect, is used to portray the brief life of innocence and to respect the dead soldiers, which brings me and you to another comparison that can be made, they are both staunchly anti-war, to what severity can be debated endlessly but it’s there, and it’s loud and it is understandable. Most, if not all, the bad things that happened to the characters in both stories can be attributed to World War Two. If you had read or watched Barefoot Gen or Grave of the Fireflies which you probably have if you are reading this article (If not…then why are you reading this; You’re ruining yourself on a madding, depressing trip through hell and back) you may have noticed the passion, the people who have wrote these stories were driven to tell them, if it was not for that then who knows if we would have ever gotten these magnificent pieces of work, works so deep with symbolism and meaning that one could endlessly debate about the works and the similarities about the two, which means that this article could technically go on for hundreds or thousands of pages about the similarities and why that may be, but who has the time or the patience to read or listen to something that is complementary to the works that is longer than those two works combined. It is highly likely that few people will read this whole article in the first place so why even bother writing this article? Because I am DRIVEN BY MY PASSION FOR THESE WORKS SO MUCH THAT I WROTE A WHOLE ARTICLE COMPARING THE TWO, EVEN KNOWING THAT FEW PEOPLE WILL READ IT BECAUSE I LOVE THESE WORKS THAT RIPS OUT MY HEARTSTRINGS. 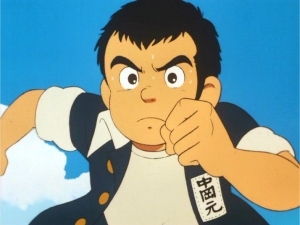 But I am not talented,disciplined,nor driven enough to write about all the similarities between Barefoot Gen and Grave of the Fireflies, there’s just so many. I don’t how they can be so similar but somehow they are and even more bewildering is that they can be unique and good enough that I would recommend both to anyone. See what I did there? I took a whole paragraph to tell you that I can’t write down more stuff about this while simultaneously writing down more stuff, I’m sorry, this article needs to be handed in on time. I give apologies to Sam Kusek and Edward Sizemore, who gave me this opportunity and I am sorry for this train wreck( but not sorry enough to stop this train wreck but I’m still pretty sorry). I also give a big apology to Thomas (a.k.a. @ABCBTom on twitter) He was supposed to do this article and would have done a much better job than me and yet CRUEL FATE caused him to be unable to do his article in time for the Manga Movable Feast causing me to pick up the torch; to him I am truly sorry. Since I am being so meta right now I might as well give credit where credit is due at this point. Thanks to Sam Kusek (@SamKusek on twitter) for creating the Manga Movable Feast and having this one be about Barefoot Gen. hopefully the MMF will spread awareness of this piece of work and I also give him thanks for giving me (Patrick Jones @Johnny_Jobbs on twitter) my chance to shine…and fail miserably. I also give thanks to Edward Sizemore(@edsizemore on twitter) for talking Sam Kusek into letting me write for the MMF. But I give BIG thanks to Akiyuki Nosaka and Keiji Nakazawa for creating In my humble opinion what is essential read/watching to anyone and is something that everyone should read before they die( you can find Barefoot Gen and Grave of the Fireflies and Hiroshima: The Autobiography of Barefoot Gen and purchase them by clinking the clicky links in this sentence). Now that I’m done I need some way to end this article………………………………………………Hm…………………………………………………………. P.S. I don’t own any of the photos used in this article; now you know. Rob McMonigal over at Panel Patter is working on a newer posting for the Feast but in the mean time, wanted to share his reviews for volumes one, two, three, four, five, six and seven respectively. Anna of Manga Report, talks about an excerpt from the classic Frederik L. Schodt book Manga! Manga! The World of Japanese Comics and how it introduced her to our choice this month. Michelle Smith, Soliloquy in Blue, shows us her stuff with a review of volume one, where she speaks more to her reactions to the Nakaoka family pre-bomb. John Thomas at the Manga Village compares Barefoot Gen to The Drifting Classroom in his review of volume one. Daniella Orihuela-Gruber of All About Manga talks about her atypical reaction to the series, due to her upbringing & experiences at a private Jewish school. Ash Brown at Experiments in Manga brings another review of volume one to the table. That’s all the postings for today. I will leave you with the banner from the live action Barefoot Gen film. Awhile ago, while I was still in school at Emerson College, I wrote a paper for a class called On Death and Dying, that explored different aspects of how we as people portray and ultimately deal with the inevitable ending of our lives. My case for this paper was to argue that the Comics medium, in the past few decades, has the ability to hold the same sense of emotional significance and conveyance when portraying traumatic events or wrongdoings that other media, like print and television, have. 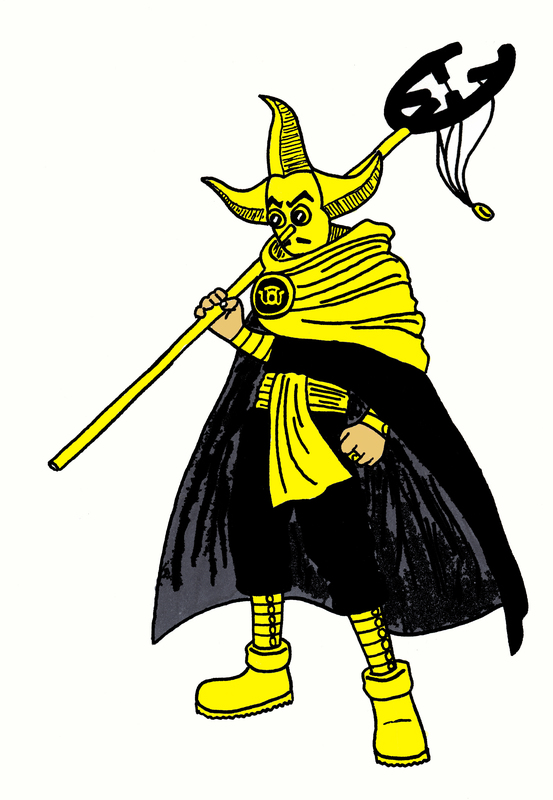 While I made my point, providing seemingly endless examples like Denny O’Neil’s Green Lantern/Green Arrow and specifically, a comparison of Art Spiegelman’s Maus and Keiji Nakazawa’s Barefoot Gen, a true exploration of the content was never fully realized. I was merely stating facts about how books conveyed emotion and trauma but not how they helped us to learn from the events. That, ladies and gentlemen, is what I hope to accomplish with this posting: a comparative look at how Maus and Barefoot Gen, two outstanding works about horribly traumatic events, show us the basic human levels of survival and how trauma ultimately affects the rest of the world around us. To start, I want to get my artistic points out there, before I get to the meat and potatoes of the discussion. 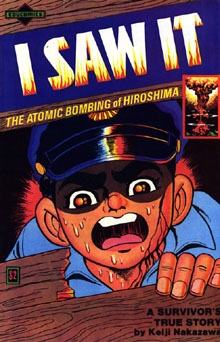 I think Barefoot Gen‘s artwork really detracts the stories more serious elements for me. I have never seen this specific point brought up before, instead the opposite (that the artwork is frighteningly horrific) has, but I find the artwork a little too cartoony; almost in a Disney-esque sense. It really takes me out of the context of the story and we all know for a fact that this wasn’t Nakazawa’s intention. His images have struck chords with other artists, including Spiegelman who states “I will never forget the people dragging their own melted skin as they walk through the ruins of Hiroshima, the panic-stricken horse on fire galloping through the city, the maggots crawling out of the sores of a young girl’s ruined face.” Maus on the other hand, takes the cake in this aspect, creating a clever method of representing race and prejudice through the guise of animals, intentionally taking a less harsh route artistically. The Jewish people are mice, with their German hunters portrayed as cats; feeble mice powerless in the face of their predator. It creates this fantastic, easily accessible imagery that allows the reader to understand the realty of the situation by an extremely commong association. Maybe its because I’ve never been in any traumatic accident myself (godbless) but for me, a cat chasing a mouse is more representative an image than a city in flames. When you boil both stories down, looking past all the agonizing moments of each book, both works place a large emphasis on the importance of familial connections. Throughout Barefoot Gen, the main character, Gen, is almost always surrounded by a larger group of people and no matter who they are, whether blood relatives or other bomb orphans, he regards them as family. There is that real sense of community in that respect; that sticking together and utilizing their unique strengths to survive is the best option. It is also allegorical to how Japan, a nation who had its spirit broken by the effects of the bomb, has to now piece together what they have left and rebuild, creating a wonderfully universal lesson that can be taken away from the work. The idea of family exists in Maus in a very different way. Maus is a story that focuses much more on the individual experience of dealing with Trauma, both in actual victims and how it extends to their next generations. In fact, by sharing with the younger generation, survivors teach them to appreciate what they have and what their ancestors went through to pave the road for their future, however, this constant reminder cane create a severe implication upon 2G’s or second-generation survivors. Many 2G’s try to separate themselves from their parents and the holocaust experience. It is a scar on their mind, letting them know that “there is nothing we can ever do that will be as important as our parents suffering.” For 2G’s to forget what they were told about the experience is awful; almost a sin. Forgetting brings shame and anxiety to second-generation survivors. Thus they strive to remember, to understand and build upon the teachings of their ancestors. To remember these experiences is to discover a part of themselves; to understand their heritage. Just like their parents, second generation survivors forge the road for the future by remembering the past. Throughout the book, Art Spiegelman conveys his struggle to deal with the past, especially as a child. Growing up with the memory of the Holocaust in his house, something he could never understand or share with his parents unlike his brother Richeu. Art sees this “ghost brother”, his actual biological brother who died in the holocaust, as “the ideal kid” who “never threw tantrums or got in any kind of trouble. He would’ve become a doctor and married a wealthy Jewish girl…the creep.” This whole book is a result of Art’s attempt to reconcile these feelings of guilt he gets from his survivor parents, by understanding his father’s struggle, which I think within itself is an interesting contrast of Barefoot Gen. While Maus deals with the Holocaust, it is never really about the effect it had globally or on a historical level; if you look closely, there isn’t even a Hitler figure in the book. It focuses solely on individual experiences; Vladek’s survival in the camps, Art’s understanding of his father’s struggles and still dealing with unexpected suicide of his mother. The book takes a more indirect approach at how trauma affects people by exploring those intricate subtleties in how everyday is changed, over an extended period of time. Barefoot Gen is about a once proud nation struck down in their prime. Through Gen’s eyes, the reader experiences the immediate effects of tragedy; we are living in the present with him. We, as viewers, see Japanese families torn apart, talented artists and writers afflicted by disease, the rising of gangs and black market goods, famine, poverty, drug abuse and countless, endless deaths. It is the most direct way of discuss the effects of the bomb, by showing us how it effected the nation as a whole. Marc Sobel of Unattended Baggage, argues in favor of the series in response to Derik Badman’s dislike of the series. ABCBTom provides an introduction to what he hopes to accomplish this MMF, a comparison of the film version of Barefoot Gen & Grave of the Fireflies and “the misuse and willful misinterpretation of victims’ literature”. Here are the links from Day Two. Great postings so far, lets head towards a better tomorrow! Announcing the Next Manga Moveable Feast! 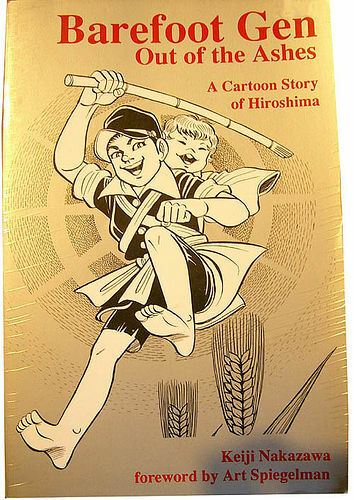 I am happy to announce that starting February 13th til the 19th, A Life in Panels will be hosting the 11th Manga Moveable Feast – Keiji Nakazawa’s Barefoot Gen.
For those of you not familiar with the series, it chronicles the events of the Hiroshima bombings through the eyes of a six-year-old boy, Gen Nakazawa, as he and the surviving members of his family deal with the aftermath of the bombing. Published by Last Gasp, there are ten volumes in total, as well as two films and a live action adaptation. This is a series that, as you will soon find out, is near and dear to my heart and I am ecstatic to see what kind of articles & opinions this MMF will produce. If anyone reading this blog isn’t familiar with what the Manga Moveable Feast is, can take a look at Matt (Rocket Bomber) Blind’s handy introduction to the project. If you’d like to participate but don’t have a blog or don’t think the subject is right for the blog you already have, I’d be happy to host your guest pieces during the Feast. Just email me the post at skusek at yahoo dot com. As many of you know, I am a big X-Men fan, as evidenced by the first entry in this blog and my contribution to the May To Terra MMF titled From Blackbirds to Battleships, and while Shojo manga hasn’t always been my cup of tea, the idea of taking a primarily masculine action comic and boiling it down to its core emotional human values was incredibly appealing to me. That’s what makes X-Men so great, is the emotional and romantic struggles that the mutants have amongst all this action; they are real relatable people. I’ve always been able to connect with these characters because I know how it feels to be different & shunned for it and I’ve always felt that the comics need a deeper exploration of these character elements and what better way to do it with a genre of manga that’s been known for doing just that? So did it live up to my expectations? Did X-Men Misfits bring our merry mutants into a new thoughtful light? Not exactly, X-Men Misfits is a bit of a weird mess. Written by husband and wife writing team, Dave Roman (Astronaut Elementary) and Raina Telgemeier (Baby Sitters Club, SMILE ) weave the tale (or in this case tail) of 15-year-old Kitty Pryde, as she discovers her intangibility or phasing, is sought out by Magneto (looking rather dapper) and is enrolled in the Xavier’s School for Gift Youngsters. The only problem: she’s the only girl at the school, surrounded by a bunch of winged, blue skinned, multiple and “accurate” (I hope someone gets this reference) boys all out to get in with her. I have mixed feelings about this premise. I mean, is she really the only other female mutant aside from Storm and Jean (who isn’t in this volume mind you) that Xavier and Magneto have found? What I like about it is that it centralizes the readers focus onto the character and her struggles, rather than the school and its issues. It’s nice to have a concise approach to a lead character instead of the focus shifting in the book. What I don’t like about it is the objectification of Kitty. Immediately right when she walks in, Her being the only girl in the school makes her a prize to all the other boys. 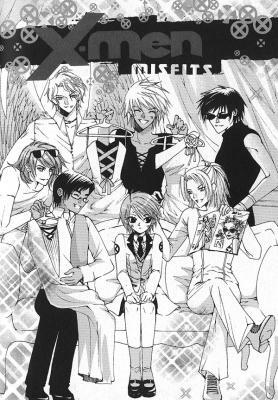 She gets involved with the overly possessive Pyro and his hellfire club, the manga’s Bishounen group, who treat her more like an exotic pet than anything else. The worst part of it is that after she realizes this and all the issues that she has with Pyro, she doesn’t stand up for herself, her abilities or her womanhood. She instead runs and finds comfort & protection in the arms of other male mutants (Xavier, Iceman, Cyclops). That was one of my biggest problems with this book, is that Kitty Pryde, a character so synonymous with being a strong, independent female character is reduced a weak lovelorn teenage fool. There isn’t a sense of personal growth within the book. There isn’t a strong sense of female empowerment throughout the book on a whole. After Kitty shares her unique trait with the Hellfire Club, they refer to it as a “pretty girly power”. Another example is when Nightcrawler or Kurt Wagner & Kitty are paired to train together, Kurt refers to his teleportation as wimpy. This book emphasizes that violent & powerful element of X-Men that I’ve always disliked, the idea that mutant abilities (human evolution) are only to be praised useful if they are destructive, masculine and strong. In addition to this glaring issue, I found that the story was in need of that old media rule “Show, Don’t Tell”. There are a number of instances: where Kitty talks about Pyro being a good boyfriend to her and helping her come to terms with her special abilities, Magneto mentions what sounds like a really cool use of his abilities etc but we never get to see these played out. It creates this weird pacing issue with the story, where the reader has a fabricate a lot of this world in their head and fill in, what I think, is too many gaps. I’d also like to bring up is the artwork, which unfortunately, is incredibly inconsistent. There are some magnificent scenes in this manga (when Angel descends down the stairs for the first time, when Pyro and Kitty first kiss) but most of the normal panel artwork isn’t very good. Characters faces change shape constantly, most everyone looks the same and there is a whole lot of super deformity happening. Anzu has a lot of talent, that is not without question. I just wish she could pick a style choice and stick with it; I’d love to see her really buckle down and focus on those minute details that bring her art to life. Ultimately, I would only recommend this book to series Manga fans (and by that, I mean people who are in or care about the development of the industry and trying things like this again) but not to X-Men fans. I don’t think it really does anything for the franchise. The characters in this don’t complement or work from the original source material; they are only represented in image & namesake alone. Heck, some of them aren’t even named! Did anyone catch the Gambit reference? I still don’t understand why he was in the story, considering he got one line and it was more or less your welcome. Want to know what I would do? Take this concept but use the First Class cast. It’s all already there: great tension between Warren and Scott for Jean’s affection, Bobby’s insecurity, Hank’s beastly changes. This book bite off way more than it could chew and it is too bad because this could’ve been great.